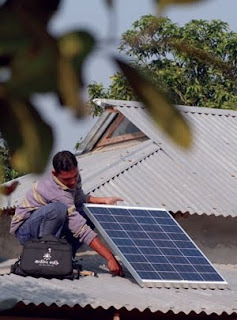 The Solar Home System (SHS) dissemination programme in Bangladesh is considered to be one of the most successful of its kind in the world, bringing power to rural areas where grid electricity supply is neither available nor expected in the medium term. The program started in January 2005 and nearly 350,000 SHSs were installed by the summer 0f 2009, most of which had a rated power output of 50W. Systems came with 3-4 compact flourescent light bulbs. Owners benefit from lighting, especially in their kitchens and courtyards, and also use the systems to charge batteries, power radios, and even run 12V televisions. While statistics are lacking, it appears that some owners are using the power in their small stores and restaurants, boosting their income. This is a great program beautifully suited to regions without existing electrical grid infrastructure, and has the potential to have a lasting and powerfully positive impact on the energy poverty that afflicts much of the developing world. Even small amounts of electricity can change lives for the better by providing lighting for reading, heating and cooking that doesn't burn nasty fuels with toxic byproducts, and the ability to create a business, boosting the local economy. ...the rapid increase in financial resources channeled to climate mitigation, in particular in the clean energy sector, presents an opportunity to integrate renewable energy projects with development projects to reinforce synergies between climate change mitigation and development. This means that efforts must focus on improving the efficient and equitable allocation of carbon finance to projects that generate the largest carbon and development benefits. At the project level, the design and implementation of renewable energy projects should focus on key issues—such as targeting, integration, and coordination with poverty alleviation programs—in order to maximize the carbon mitigation and development benefits. Adapted from an earlier post on my previous blog. Does Gas Cost Too Much? What Word Goes with Farms and Bags?